Description: Priestly functionaries occupy a paramount position in the study of the Hebrew Bible. Despite more than a century of critical research, questions still abound regarding social location and definitions of the various priestly groups, the depictions of their origins, their ritual functions, the role of the laity and family religion, the relationship between prophecy and the priesthood, and the dating of texts. Making use of cross-disciplinary approaches, this volume provides a representative look at the state of current research into various aspects of priesthood in ancient Israel. Citation: Pekka Pitkanen, review of Mark Leuchter and Jeremy M. Hutton, eds., Levites and Priests in Biblical History and Tradition, Review of Biblical Literature [http://www.bookreviews.org] (2013). 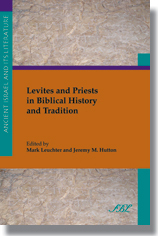 Citation: Ralph K. Hawkins, review of Mark Leuchter and Jeremy M. Hutton, eds., Levites and Priests in Biblical History and Tradition, Review of Biblical Literature [http://www.bookreviews.org] (2014).